Yes it does, fam . . .
No template will cater to all the variance any two people will have in their paper (think variance in title length, different items in lists, etc.). That is to say, the templates are not perfect, they are just that—TEMPLATES—a bare-bones skeleton onto which you map the unique DNA that is your paper. Ok, now that that's out of the way, most formatting issues I see come from a failure to understand styles. A style is a preconfigured set of attributes applied to any given variable within your document. That was a long and fancy definition so perhaps an illustrative scenario is in order. All that makes a template a template is the fact that a number of styles has been pre-set. Imagine that you want to quote a source in block quotation format, but do not want to manually set the proper indentation (0.35in bt-dubz) and single spacing EVERY TIME. Wouldn't it be nice to have a single button to click that sets those parameters for you? There is!!!!! This button is a style. Now imagine that you realize you used the wrong font for your block quotations but don't want to click through all of them. You need a place where you can make all the edit in one window; you need a style. Ok enough theory, let's see what this actually looks like. Each one of those little "blocks" is a style. While useful, this view is somewhat limited because, as you can see, only 6 or 7 styles are visible. In my version of Word, I prefer to keep my styles pane open. In older versions of Word, the style pane can be accessed by a small arrow next to the initial style palette. Once you click the arrow the style pane—seen in the bottom half o this photo—will appear. Accessing the styles is the first step to effectively using them. If you don't remember anything from this post remember this sentence: Most every formatting mistake on the template happens because students fail to match a given portion of the document to the relevant (preset) style. The moral of the story is to make sure you click the appropriate style BEFORE you start typing stuff. To do this, you need to know how the styles are titled. For this information, simply click on an element in the template document and observe which style gets highlighted in the style pane. The style for the title of the research paper is titled "TITLE PAGE TITLE 1 LINE." I know this because when I place my cursor in that spot, the style pane (on the right) will tell me. So, when I go to type my title, I MUST make sure "TITLE PAGE TITLE 1 LINE" is selected. Notice too that There is a style titled "TITLE PAGE TITLE 2 LINES" and one for 3 lines. So, if your title has two lines, guess which style you need to have selected? Side note: To select a style, you can either click it beforehand and then start typing, or type it first, highlight it, then select the style. Turning from the preliminary pages of a paper, we will now go over common issues in the body. Probably the two biggest issue I see is (1) a failure to make sure the body of your text actually has the "body of text" style, and (2) headings. Word's default style for the body of your text is called "Normal." You a actually see this in the picture above. Repeat after me, NORMAL IS BAD. Who wants to be normal? The proper style for the body of your paper is....wait for it..."body of text" (gasp!). There you have it. Before you begin typing on the template, simply place the cursor where you want to type and make not of which style gets highlighted in your styles pane. 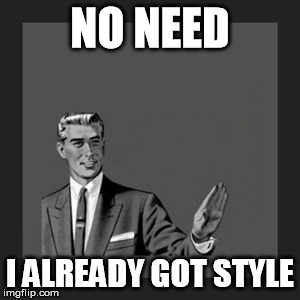 Either select the style before typing, or type it, highlight, and then select the style. I hope this helps. Please leave any questions in the comment section below!